When crime rates began to climb in St. Louis in late 2014, Police Chief Sam Dotson offered an intriguing explanation. A “Ferguson effect,” following the widely condemned killing of a black teenager by police in a nearby suburb, had led to trepidation on the part of some officers in enforcement situations, and to a feeling of empowerment among offenders. The theory provoked significant interest among law enforcement officials and academics who have since debated its merits in academic studies and in the press. FBI Director James Comey has given it further credence, suggesting police have become more cautious due to a fear of being caught on camera. But nearly two years after Dotson’s initial remarks, there is little agreement about what form the Ferguson effect is taking, or even if it exists at all. Nor is there consensus about whether a national crime wave is actually occurring. The latest research on the issue, conducted by University of Missouri–St. Louis professor Richard Rosenfeld for the Justice Department, found a spike in homicides between 2014 and 2015. The number of murders in 56 large cities rose an average of nearly 17 percent in that one year -- the steepest annual increase since at least the 1980s -- and 12 cities recorded spikes exceeding 50 percent. Most striking was the revelation that the 10 cities with the biggest increases were characterized by large African-American populations. “The increase is real and worrisome,” says Rosenfeld, who now thinks the Ferguson effect theory is plausible. The findings come with several caveats: It’s not yet known just how widespread the increase in crime is; the one-year jump in the murder rate follows decades of decline; and recent national trends for other types of crime aren’t yet available. Overall crime rates in a different sample of 30 large cities reviewed by the Brennan Center for Justice were essentially unchanged last year. The aspect of the Ferguson effect that’s received the most attention is the notion that officers are pulling back on enforcement and proactive policing, fueling a crime increase. In Chicago, shooting arrests dropped last year, but gun violence climbed in the months following the release of a video showing the police shooting of 17-year-old Laquan McDonald. “We have allowed our police department to get fetal, and it is having a direct consequence,” Mayor Rahm Emanuel said at a meeting in 2015. Meanwhile, a second version of the Ferguson theory, one that hasn’t received as much publicity, is gaining traction. It contends that heightened racial tensions and a distrust in police are contributing to higher crime rates. L.A. Police Chief Charlie Beck cited the lack of public trust in police as the “real Ferguson effect” in an op-ed in the Los Angeles Times earlier this year. Weaker links between law enforcement and the community make police less effective, he wrote. Testing this emerging hypothesis, however, is difficult. Research by Yale University professor Tom Tyler suggests that procedural fairness influences the perception of police legitimacy, which in turn acts as a strong determinant of public compliance with laws and a willingness to cooperate with investigations. A July Gallup poll found 67 percent of blacks felt they were treated less fairly than whites by police, a rate that’s remained fairly constant over time. Similarly, a recent Pew Research Center poll reported 18 percent of blacks said they’d been stopped unfairly in the previous 12 months, compared to just 3 percent for whites surveyed. While law enforcement agencies have worked to strengthen local ties via community policing efforts, Aziz says, they’ve often failed to engage groups of African-Americans with negative perceptions of police. Serpas, a former New Orleans police chief, doesn’t think the “declining trust” version of the Ferguson effect is any more valid than the de-policing argument. He points out that gaps in trust have remained consistent over time. “Over 30 years, we’ve made a lot of changes and haven’t really moved the needle much,” he says. Homicide spikes in some cities, Serpas believes, are more likely a result of factors like more children being born into disadvantaged families or repeat gun offenders not being locked up. The Justice Department report also considered the effects of falling imprisonment rates and expanding heroin markets, but these trends predate the recent rise in homicides. Any effects of recent high-profile shootings involving police are likely playing out differently across cities. It’s worth noting that just 10 of the 56 cities reviewed in the Justice Department study accounted for two-thirds of the surge in homicides. “Any increase in crime is driven more by local factors,” says Ames Grawert, an attorney with the Brennan Center for Justice. Further clarity on the Ferguson effect should come later this fall, when the FBI releases complete 2015 crime data compiled from all participating law enforcement agencies nationwide. Rosenfeld and others argue the FBI should release preliminary numbers more regularly, similar to economic reports, instead of waiting roughly 10 months after the end of each year. The FBI says it’s redeveloping its systems and anticipates more frequent publications. 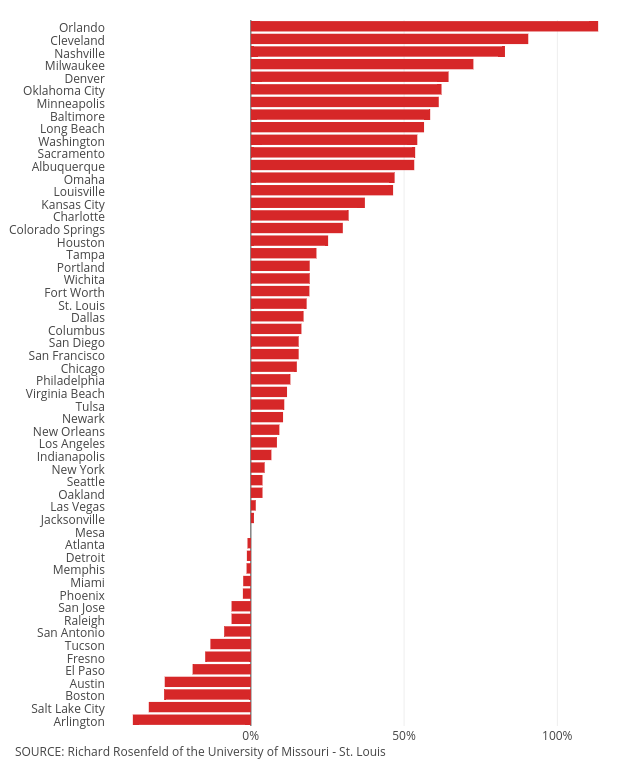 Mouse over the chart to see percentage changes for each large city.